The Georgia Chapter of the American Academy of Pediatrics (Georgia AAP) Continuing Medical Education (CME) program aims to develop, maintain, and improve the competence, skills, and professional performance of pediatricians and pediatric healthcare professionals. Pediatrics by the Sea strives to meet participants’ identified educational needs and support their life-long learning by providing quality, relevant, accessible, and effective educational experiences that address gaps in professional practice and improve patient outcomes. The Georgia AAP is committed to excellence and innovation in education. Practice evidence-based, informed pediatric medicine. Apply current techniques and procedures. Advocate effectively for issues related to children’s health. Demonstrate change in competence, performance or patient outcomes. The American Academy of Pediatrics – Georgia Chapter is accredited by the Medical Association of Georgia to provide continuing medical education for physicians. The American Academy of Pediatrics – Georgia Chapter designates this live activity for a maximum of 17.5 AMA PRA Category 1 Credits™. This activity will be submitted to Georgia Nurses Association for approval to award contact hours. Georgia Nurses Association – Approver is accredited as an approver of continuing nursing education by the American Nurses Credentialing Center’s Commission on Accreditation. Pediatrics by the Sea is open to all pediatricians, residents, pediatric nurses, nurse practitioners, physician assistants, family physicians, medical students, and other child healthcare professionals. To register for Pediatrics by the Sea please register below or contact us for further information. Exhibit hours will be held on Friday, & Saturday; please plan to stop by and visit. 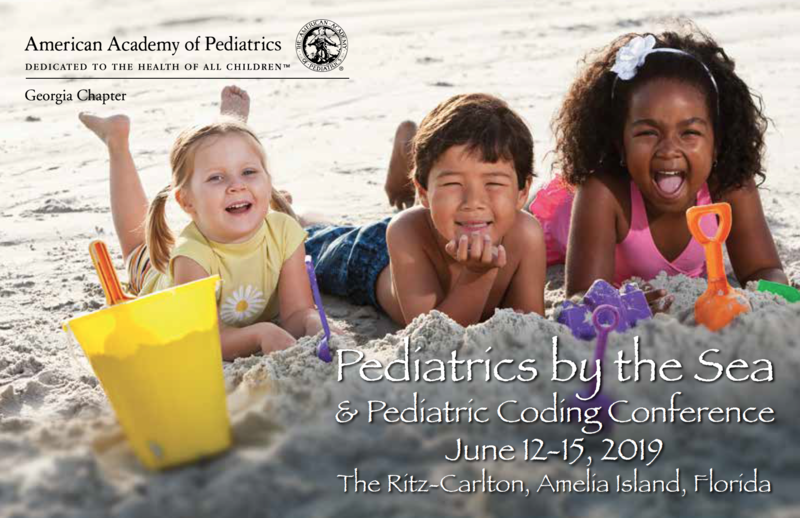 Pediatrics by the Sea conference attendees will receive electronic versions of the speakers’ handouts via email two weeks prior to the meeting. Participants can pre-print handouts from the web site, or, bring their device to the session. (Note: Wi-Fi will be available in the meeting areas, and attendees who bring their device can sit in the “Green Zone” in the session where electrical connections will be available.) No Printed Handouts or Syllabus will be available. Join us in our environment-friendly effort. Amelia Island offers visitors an unspoiled setting for relaxing and rewarding stays. Thirteen miles long and two miles wide, the northern and southern tips of the Island are park preserves which make up nearly 10 percent of the entire Island. Surrounded by the Atlantic Ocean, Intra-coastal Waterway, Nassau Sound and one of the East’s largest and deepest inlets – Cumberland Sound – Amelia Island is edged with natural Appalachian quartz beaches and framed by dunes as high as 40 feet. Amelia Island’s small size belies the host of activities she offers her guests. From golf and tennis at world-class resorts to kayaking, sunset sails and horseback riding on the beach. The Island offers all types of accommodations, restaurants and shops to meet the needs of the most discriminating traveler or budget-minded family. The Island is home to Florida’s only spoken history museum. The island is located adjacent to the historic community of Fernandina Beach, Fla. For more information about the Amelia Island & Fernandina Beach area visit www.ameliaisland.org. Find yourself in the place where Southern charm meets the sea and live oaks meet white sandy beaches. One of the most popular beach destinations on the East Coast, this barrier island resort provides a welcome barrier between you and the world beyond. Located on a grand stretch of the island’s 13 miles of coastline, The Ritz-Carlton, Amelia Island is a AAA Five Diamond hotel and was ranked as one of the top 100 hotels in the US by Travel & Leisure Magazine, and one of the top rated family resorts in the country (see below). It features well-appointed guestrooms, including club rooms & suites; four restaurants and lounges; The Ritz-Carlton Spa; a fitness center; nine ocean side tennis courts, & 18 holes of PGA championship golf at its front door! To reserve your room at our specially arranged rates, please call 904-277-1100 or 866-763-2960. Rates are $329 a night for a single or double, Tuesday thru Saturday. Please call by April 27, 2019 for best room availability and mention that you are attending Pediatrics by the Sea. Reservations can also be made online. There are two receptions at Pediatrics by the Sea for your enjoyment. On Thursday, we’ll have our Welcome Reception and on Saturday night, the President’s Reception. These events are for all attendees, exhibitors, & their guests. The Ritz-Carlton at Amelia Island was rated Top 10 Child Friendly Resorts in USA by Child Magazine. The Ritz Kids program offers a variety of supervised physical and creative activities designed especially for children aged 5-12. Offering full or half-day options, seven days a week, Ritz Kids has something for every child. CME sessions are summer business casual. (You may want to bring a jacket or sweater as the meeting rooms are sometimes cool due to the air conditioning.) Attire for the evening receptions is resort casual. Access by Car: From I-95 – Take I-95 to Exit 373 (old 129), turn east onto A1A, travel 15 miles crossing the Intracoastal Waterway onto Amelia Island and follow signs to the Ritz-Carlton. Arriving by Air: Less than 30 minutes from Amelia Island, Jacksonville International Airport (JIA) links Northeast Florida with cities across the United States and abroad. Several major carriers service Jacksonville. Now a PBS tradition, join Evelyn Johnson, MD, Chair of the Chapter’s Healthy Weight Task Force, for the Chapter’s Annual PBS Run/Walk event Saturday, June 16. Meet at the Ritz-Carlton lobby to run or walk (5K/3.1miles) on picturesque white sandy beach. If you have physical or dietary needs, which require accommodation to fully participate, please indicate on your registration form or call the Chapter Office. Cancellations must be received in writing before May 24, 2019 to receive a refund. The cancellation must be faxed to the Chapter office at 404-249-9503. Refunds will be processed following the meeting, less a $40 administration fee. Cancellations made after the deadline will not be eligible for a refund. For More Meeting Information call 404-881-5091. In addition to the beautiful Ritz-Carlton, the Amelia Island and Fernandina Beach, Florida area offers several other options to meet every taste and preference. Here are other lodging options, all just a few minutes away from the Ritz-Carlton. In addition to the Ritz-Carlton, a room block has also been reserved for Pediatrics by the Sea attendees at the Marriott Residence Inn, Fernandina Beach. 9:20 – 10:00 am Child Sexual Abuse: Am I Different? Confirmations and links to meeting handouts will be sent via email. If paying after May 24th please check this. One Day Rates: Please indicate if you plan to attend ONE DAY ONLY. If attending for a single day and you are not a member please check above.